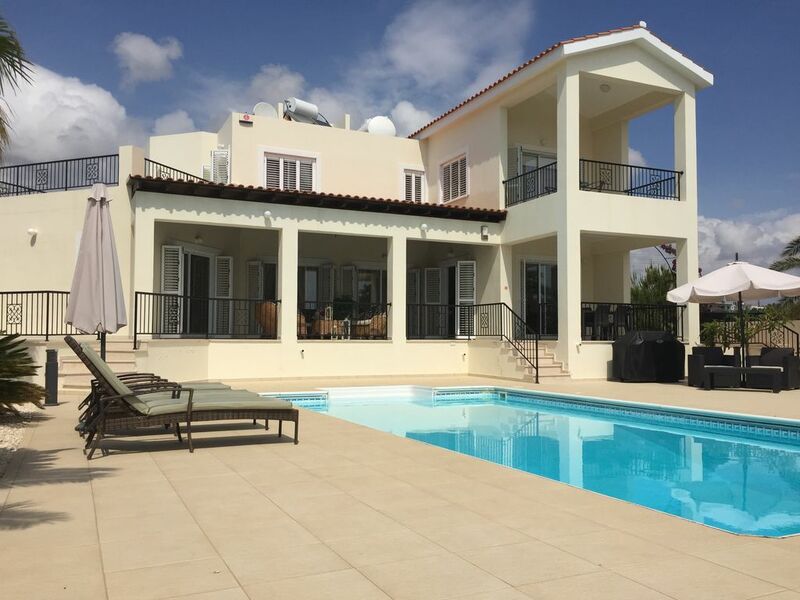 Villa Isabella is in a prestigious area is well equipped and surrounded by a large landscaped garden on all sides and private pool with sunbeds and umbrellas for your total relaxation. In a rural location with stunning sea views and being able to walk and see the famous caves themselves only 0.2 Km away. At the same time you are not isolated - local restaurants are close by and for families looking for some "neon lights" Coral bay is barely 4 Km away. With large windows all round the living area it is a spacious and comfortable villa. Large high specification kitchen-dinning area is also adjacent to a vast covered terrace that overlooks the landscaped garden and a 10 x 5 m stepped swimming pool. Going up the marble staircase are three full size bedrooms with the master bedroom being particularly impressive with a huge terrace for those unforgettable views - you cannot bear to turn your back on. We have always loved Cyprus and have owned an apartment prior to purchasing the villa. We love the Sea Caves area because it is peaceful and quite but not to far from the beaches, restaurants and nightlife. There really is something for everyone to enjoy here.Nice and flat so great for walking! You really could not get much closer to the famous Sea Caves which are literally on your doorstep out the front door, the villa has a fantastic location. Being close to the unspoilt coastline and rocky landscape it is in an ideal position for endless walks or bike rides. A short drive away you have the famous Blue Flag beach of Coral Bay with all the water sport activities you'd expect or the quieter Corillia Beach. Coral Bay has plenty of restaurants from Cypriot Tavernas to European, sophisticated and quiet to noisy bars for a good nights drink or a good nights dancing with Taxis's nearby so no one has to drive home. Horse riding and Golf driving range a short drive away.A 2 minute walk to the Sea Cave Taverna (beautiful spot) Food & Drinks served and a nice friendly atmosphere! Family bathroom with shower over bath, wc, and hand basin. En-suite bathroom to master bedroom with shower, wc and hand basin. Ground floor cloakroom with wc and hand basin. Fully fitted kitchen with granite worktops oven and hob, fridge/freezer, dishwasher, microwave, kettle, toaster, water purifier system, also water cooler and smoothie maker. There are 4 championship golf courses, Nick Faldo designed Elea Estate Golf Club www.eleaestate.com, Aphrodite Hills Golf Resort www.aphroditehills.com, Minthis Hill Golf Club www.minthishills.com, and The Secret Valley Golf Club www.cyprusgolf.com. It is approximately half an hours drive to the nearest golf courses. Just back from another amazing holiday at Villa Isabella, can’t get enough of the area , the sea caves and the pool area outside, totally gorgeous. Gary the local contact for the villas upkeep, gave us some superb recommendations of places to go and eat and they were all excellent especially Valklara, the restaurant in the hills with magnificent views. The TV system got upgraded whilst we were there meaning there was an abundance of channels to keep in tough with the outside world. A stones throw from Coral Bay with its abundance of restaurants and shops, we can’t wait to return. We had a great stay at this villa, very peaceful location situated close to the sea caves. For us this was ideal as we were away from the touristy areas. Lovely villa with large outdoor area and pool. Had good communication with Peter the villa owner leading up to our stay, who kindly allowed us a late checkout as our flight wasn't until the evening. Overall a really enjoyable stay! Amazing that's all I need to say! We have just got back from a birthday trip to Peyia staying at Villa Isabella for 9 nights. Having been to the area before we knew we loved it but what made it even better this year was this villa. Perfect in pretty much every way. Lots of room for two families of 3, very clean and well presented, sea views and the most wonderful outdoor space and pool. I cannot recommend it highly enough. A few tips: out of town so a car is a must. No need to weigh down cases with beach towels as they are provided. Try Alensi restaurant on the main road as it was some of the best homemade food we had out there. We most definitely will be back!!! Activities available within a 15 minute drive include snorkeling, cycling, scuba diving, fishing, horse riding, water sports, rambling, go-carting, swimming. The villa is in a rural location with stunning sea views and only a short walk (0.2 Km) to the famous sea caves were little coves are found. The resort also boasts two sandy beaches, the closest one to the villa being Corallia Bay, the quieter of the two. A little further along the coast is the popular and busy Coral Bay Beach, where sunbeds and umbrellas are available for hire, water sports are on offer and there are two beach cafes providing refreshments. Paphos airport approx 40 mins by car. Larnaca approx 2 hours drive. Coral Bay with it's shops, restaurants, takeaway's banks and pharmacy is just 5 minutes drive away. Peyia Village with it's supermarket, bakers, butchers, fish monger, taverns and local bars is approx 5 minutes drive away. Paphos is 20 minutes drive away and has a full selection of shops, an indoor market, a beautiful harbour where you can enjoy a meal or drink at one of it's many restaurants. There is a restaurant within walking distance of the villa. The Sea Caves area is situated in a peaceful location between the popular resort of Coral Bay and the tiny fishing hamlet of St Georges. The coastline in this area is full of natural rock caves making it ideal snorkeling territory, however if you prefer an organized beach then the family oriented resort of Coral Bay is only a short drive away. Booking Notes: A 25% non refundable deposit is payable to confirm the booking with the balance payable 8 weeks before arrival. Changeover Day: Changeover day is flexible. Notes on prices: Prices are for property per week in UK Pounds.